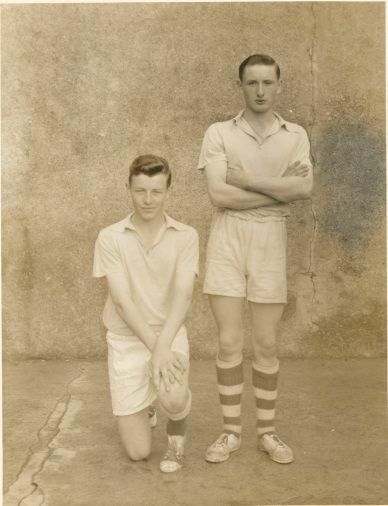 Handball has always been a very popular pastime at the College and this is no different today than it was in the time of Dan Mc Cartan and Dominic O'Loan (see photo). Students compete every year in the Ulster 40 x 20 Handball Championships held in Kingscourt, with some excellent performances in recent years. The recent installation of a One Wall by Down County Board has seen the one wall game really take off with the court used every morning and at lunchtimes. The advantage of having this excellent facility has lead to the progression of many individuals building on the excellent coaching going on in local clubs. In 2015 the Intermediate team of Daire Savage, Ciaran Bagnall, Michael Havern and Sean Fallon won the Down U.15 One Wall title, overcoming St Patrick's Downpatrick after a hard fought victory and some very close games. The Ulster competition was a bridge too far but the experience the received from this competition was a real bonus for this talented quartet. This was then followed up with a second Down title in 2016 when the team of Anton White, Jamie Mc Donald, Padraig Clancy and Patrick Cowan beat a resilient St Paul's Bessbrook team in the final after a wonderful day's Handball. There is a real buzz again about Handball in the College and it is hoped that the One Wall we have now will see many more winners crowned in the years to come.